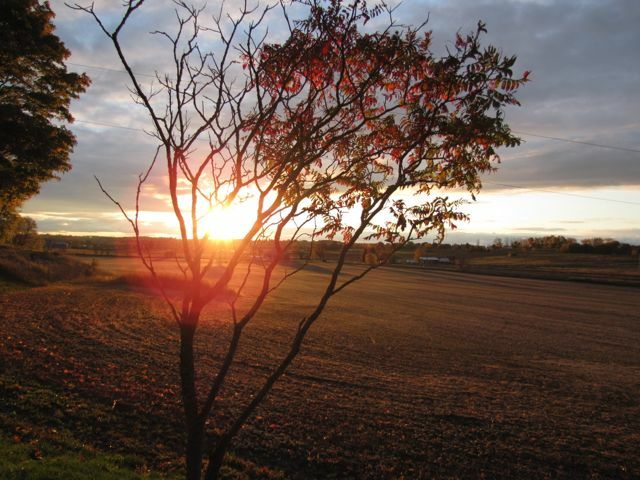 Here is a sunset photo my brother Dave took at my brother Tommy's farm last fall. Neat how a photo of nature can make you think about family. I know, it's great that we can see photos and think of things that mean a lot to us. Very cool. Did you go for a bike ride or walk today? Just finished my workout on Monster (treadmill's name), and it was great. Long, long work day on my feet, but I really needed to burn off some work-related energy. Cheers to you and a great big boogie boogie. And it wasn't even a bad day at work, just physically long. If that makes sense. I like rest days in between workouts. When I am on a jogging schedule I never jog two days in a row. I will do a light walk, but not two big workouts right after the other. Best go check the chicken. It's on the grill and smellllllling goooood. Hope your chicken was amazing! I think resting between workouts is a good way to go. I've pushed too hard before and injured myself and not been able to go out at all. No fun when that happens! Great photo! The halo around the sun in so cool! Thanks so much. My dad is the photographer in our family, and my bro picked up some talent from him. They are both always looking for the cool shot.